My life isn’t all digging in the dirt (but it mostly is)! I like to make things inside too, particularly as we move into hotter weather. 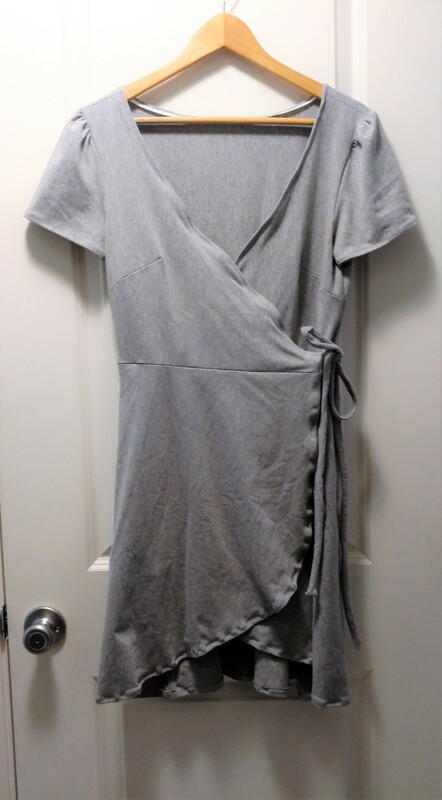 First, I sewed a simple wrap dress using Butterick See & Sew pattern B6543. It was easy to sew, as advertised. However, I’m not super happy with the sizing. Typically, you’ll want to make a muslin (mock-up) of a garment before using your final fabric, but that’s tough to do with a stretchy knit (old sheets work great for non-stretchy clothes, though). Plus, I figured a stretch knit would be more forgiving of mistakes. In terms of the Butterick size chart, I should be close to a 14. Looking at the pattern lines, that seemed a bit large, so I cut between the lines for a 10 and a 12. Y’all, that size chart is way off. I should’ve made an 8. The shoulders are falling off. Fortunately, I’ve played around with some tucks here and there, and it should be easy to sew in some neat little folds that will both add visual interest and help keep my chest from being fully exposed. Last weekend held a second sewing project (whooaaaa), this one on a whim. I buy quite of bit of fruit and veggies, and I hate the plastic bags the grocery store has. 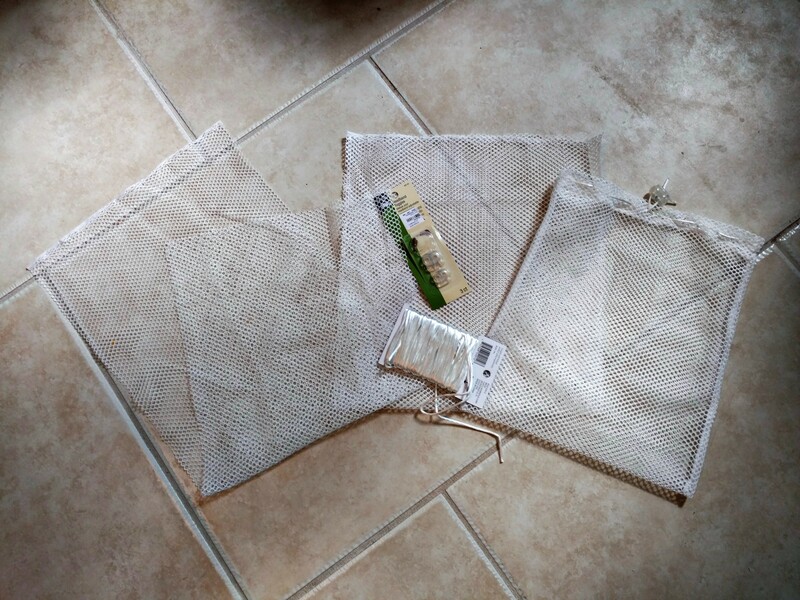 I found some netting, cord, and toggles in my craft stash and whipped up some reusable produce bags. Unlike the dress, there is no sizing issue with these. I’ve also moved them into my car, since I tend to stop by the grocery on my way home from work. The sides are sewn with French seams for durability, and the tops are folded down approximately 1 inch and secured with a zigzag stitch as the mesh has a little bit of stretch. They aren’t perfect, but they should work beautifully. Now onto another domestic art: cooking! I kept reading about how gaga people were over Instant Pots, so back in January, I ordered . . . not one of those. I actually ended up going for the Crockpot version because it was cheaper and everything I’ve owned by Crockpot has held up well. Anyway, I definitely understand why people love these things. They make amazing rice. I regularly use mine to cook around six pounds of chicken thighs to shred and freeze for lunches and dinners. They also turn dried beans into cooked deliciousness in 22 minutes! Bonus: McCoy creeping across the background. 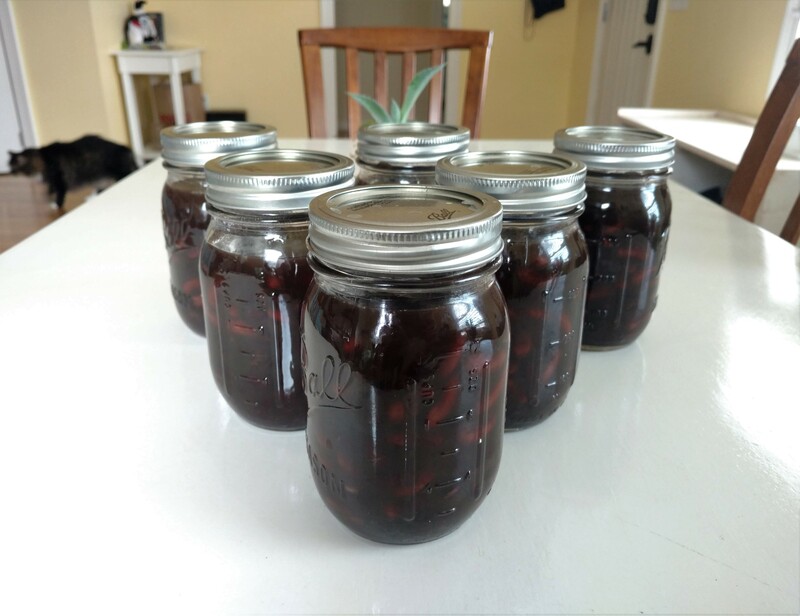 For these, I cooked 1 lb of dried black beans and 1 lb of dried kidney beans in chicken broth. I don’t know exactly how many cups of broth because I just stopped at the “Max Fill” line on the pot. Add some diced onions, set the timer, and voila! Beans for weeks. They freeze well, and they’re good. Transitions: Taking a Brief Break! How Do I Know What to Grow?